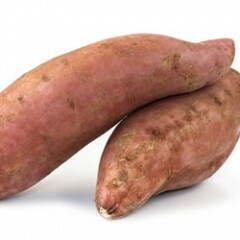 Although sweet potatoes have been grown in New York, they have received much more attention in the last couple of years due to the value of the health benefits it offers. Even though acreage is not normally recorded, we estimate that there are over 200 acres of sweet potatoes being grown throughout NYS. However, due to the long growing season that is required (100 days plus), they are generally produced on raised beds mulched with black plastic. Orange skinned, orange fleshed types are the dominant types grown here, but there are also white skinned, white fleshed and orange skinned, white fleshed varieties grown in the state. Sweet potatoes have also gained popularity with organic producers to replace winter squash production due to the fact that they have almost no disease or insect problems when grown here and can be stored longer then winter squash in many cases. The increase in winter farmer's markets or winter CSA shares has also increased sweet potato production in NY. However, deer and mice can be major vertebrate pests of sweet potatoes. Variety trials, plant density research and the use of floating rowcovers for increased production are being evaluated in the Capital District region of NY. Currently, there are 8 produce auctions in New York State. These auctions are aggregation points that allow local farmers to sell their produce in wholesale lots to buyers from across the region. To document the economic impact of produce auctions on agriculture, local businesses, family farms, and produce buyers, the Cornell Vegetable Program worked with Harvest New York to survey top sellers and buyers. A new Cornell Vegetable Program video shares general information about produce auctions, how buyers and sellers use the auctions to expand their businesses, and how local communities benefit from them. Flea beetles are a common vegetable pest affecting peppers, cucurbits, sweet potato, potato, peas, beans, beets, tomato, corn, turnip, pumpkin, melon, eggplant, and others. This short video gives you some general information about this pest. While no one wants to think about the possibility of hail hitting their beautiful crops just as they start to respond to the heat and take off, the likelihood that we will see more hail seems pretty high. So let's talk about it. Each monthly Women in Ag discussion group meeting will feature an established, innovative Farm-her leading the group on a tour of her operation and sharing her expertise on business management and production. Several guest speakers, as well as Cornell Vegetable Program staff, will be brought in to act as resource people for developing solutions to common production challenges. The May 6 meeting will cover positive public relations and navigating municipal ordinances in urban farming. The meeting will be hosted by Mayda Pozantides (Groundwork Market Garden) and Allison DeHonney (Urban Fruits & Veggies). Participants will learn about production in urban soils and how to adapt farming techniques for urban environments. The July 15 meeting will cover small fruit production and insect control led by Elizabeth Buck, CCE Cornell Vegetable Program, and Abby Seaman, NYS IPM Program. The meeting will be hosted by Gayle and Naomi Thorpe (Thorpe's Organic Family Farm). Gayle and Naomi will share their experiences managing a diversified organic farming operation and family farm transitions. Soil sampling is an important part of managing your crops, but it's important to do it correctly. In this video created by the Eastern NY Commercial Horticulture Program, Vegetable Specialist Amy Ivy demonstrates how to take a soil sample. For more information or to get soil sampling forms and supplies, visit Agro-One online. The 2019 Cornell Integrated Crop and Pest Management Guidelines for Commercial Vegetable Production are now available! Written by Cornell University specialists, this publication is designed to offer producers, seed and chemical dealers, and crop consultants practical information on growing and managing vegetable crops in New York State. Topics include general culture, nutrient management, transplant production, postharvest handling, organic production, and managing common vegetable crop pest concerns. A preview of the Vegetable Guidelines can be seen online. Updated pesticide options for economically important vegetable crop pests. New pests: beet armyworm in beets; cabbage looper and tarnished plant bug in lettuce and endive; allium leafminer in onions; and Cladosporium, Cercospora, and Stemphylium leaf spots in spinach. Cornell Crop and Pest Management Guidelines are available as a print copy ($41), online-only access ($41), or a package combining print and online access ($57.50). Shipping charges will be added to your order. Cornell Guidelines can be obtained through many local Cornell Cooperative Extension offices, or from The Cornell Store at Cornell University or call (844) 688-7620. Proceedings from the Empire State Producers EXPO conference from 2011-2019 are available online.